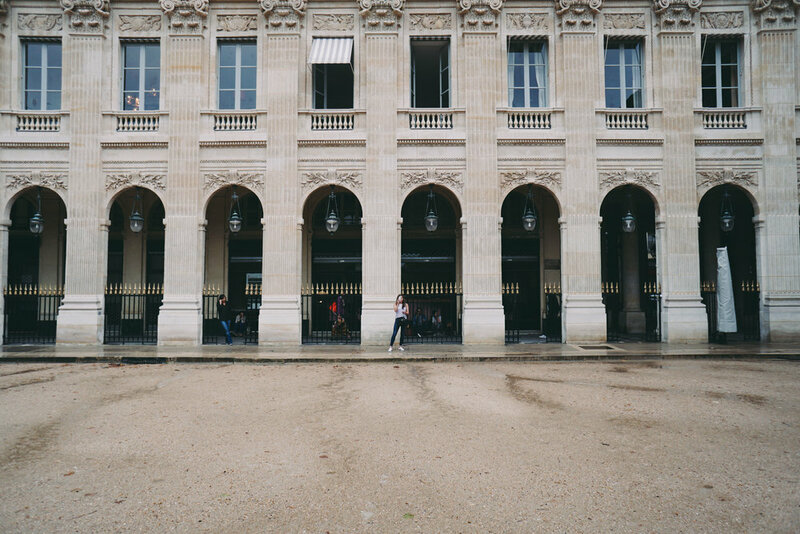 This is a short itinerary for first timers in Paris. It's a quick one for rain or shine. I live in London. My best friend Jess lives in Alaska. She came to London and we planned to travel onward to her friend’s country house outside Lyon. Rather than flying straight in and out of Lyon I insisted we take the train to Paris spend 24 hours there just so she could see it on our way. Better to have seen Paris than to not have seen Paris...right? We arrived in Paris. The air was heavy and the sky was dark and ominous. It rained. It poured. 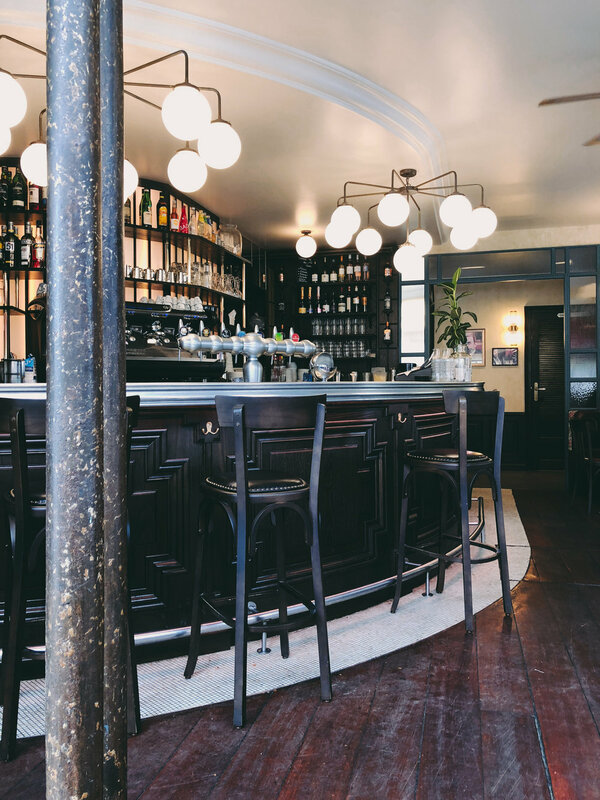 Stay near Place de la Bastille, sat at the meeting point of a few arrondissements. We stayed here. It’s inexpensive, has fluffy white beds, classic Parisian windows and thats about it. We didn’t plan to be in the room much so for us it was perfect. Get fed and caffeinated at Le Peloton. 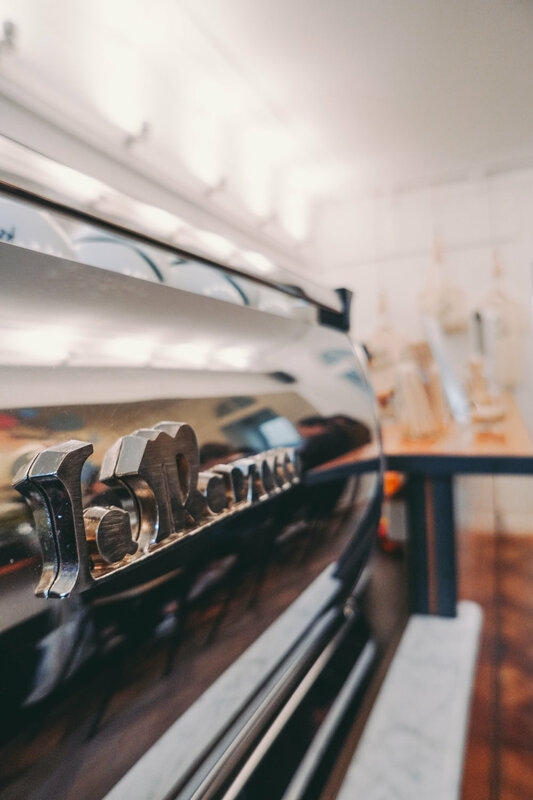 A café/cyclist joint offering decadent eats, cycling tours and of course your morning beverage of choice. The owner is from New Zealand, he chatted to us at length from behind the bar about his travels and ours. He recommended Miznon for dinner. We couldn’t make it but have since heard its amazing. Don’t be like us. Don’t miss Miznon (which I hear is also now in Chelsea Market NYC). We left breakfast feeling brighter in every way - good thing because the sky was charcoal. Rain clouds looming? Press on mes amis. Walk south to cross the tip of Île Saint-Louis and cross the bridge onto Île de la Cité. Your first sight-seeing stop is the Cathédrale Notre-Dame. Wander around the sides, back and front of the cathedral. If you want to follow the rest of this itinerary don’t get on the massive line to see the interior. Hide under some nearby trees and watch the rain plummet down, tourists whipping out ponchos and umbrellas. Ill-prepared visitors (like us) will rush for cover, throwing bags, coats and maps overhead. If it’s open, head to Berthillon for some of the best ice cream in the world. Rain or shine ice cream is always a good time. Next, head southeast use the Pont des Arts to get to the north bank of the Seine. Though the famous love locks are long gone but there are still a few rebels clinging onto the lampposts and any open spaces to be found on the now plexiglass barriers, plus there are nice views everywhere you look. This will put you right smack in front of the Louvre. As always the public areas in and around the Louvre are teeming with people. Stay on the sidelines. People watch and wait for the rain, rain like you haven’t seen since last summer. It will come and it will pour down and you will have the entire courtyard to yourself. Stay under the eaves and watch reflections of the grand museum flickering in the puddles for a few minutes. 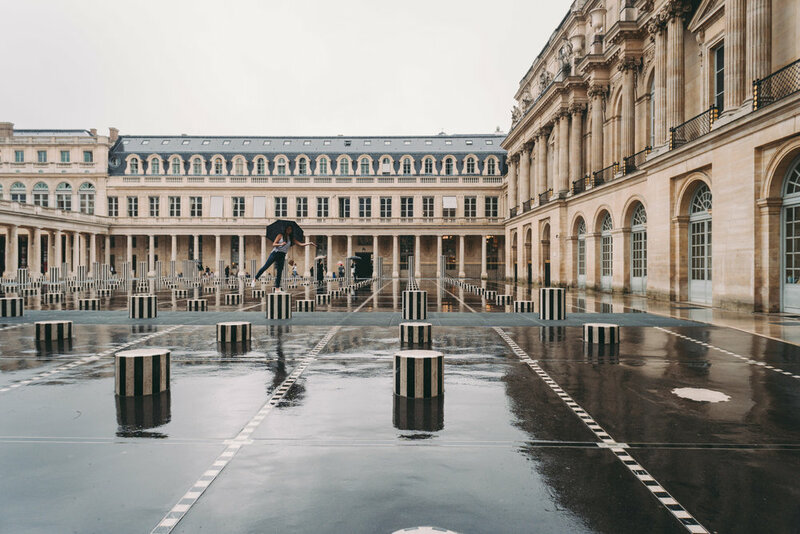 Then run like the children you are, out into the sheets screaming and twirling because what else do you do when you’re at the Louvre and it’s pouring down buckets? Once you’re good and soaked find refuge in one of the entryways with hundreds of othes. Pick up a €5 umbrella from a vendor (as a haphazard attempt at keeping your electronics dry) and head North to the Palais Royal. Dance with your new umbrella on Daniel Buren’s well known columns in the garden until the downpour becomes too much. 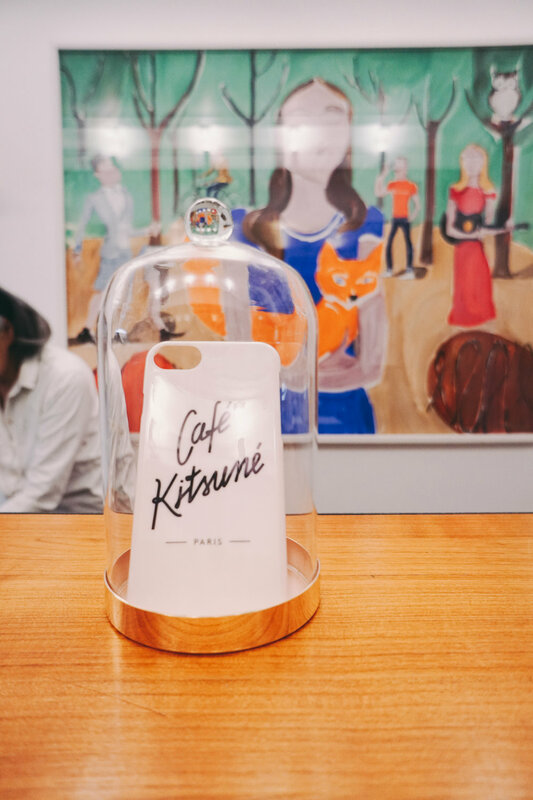 Race through the arcades to Café Kitsuné to dry off and refuel in a quirky artful setting. 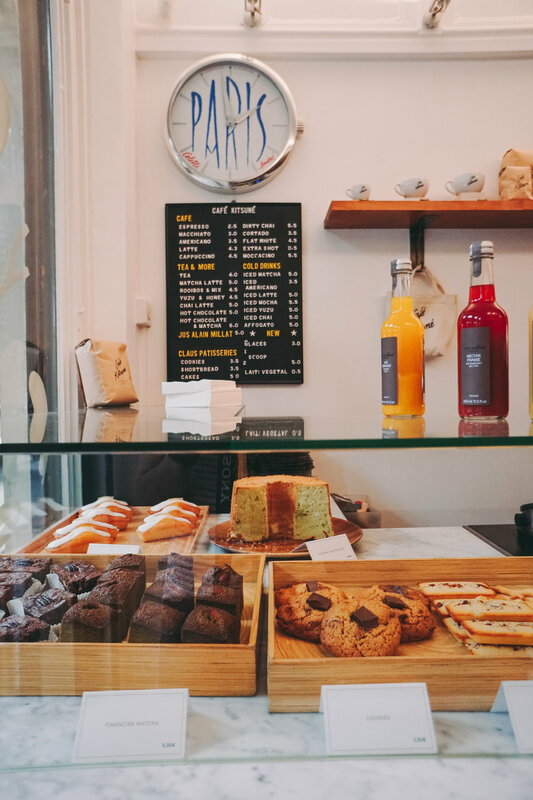 The pastries are on point and you’ll need a hot caffeinated beverage by now. Jess photographing me, photographing her. After the Palais Royal walk through the Tuileries Gardens towards the Champs Elysée but hop on the metro to save yourself the walk. Take the 1 line at Concorde and get off at George V. Make your way to the Arc de Triomphe. From below and on top it’s an incredibly grand site. Go back in time on your way up the spiral staircase, through museum-like chambers showing photos and videos of the arch from the WWII era. Get that umbrella out at the top again but don’t worry about bumping into loads of tourists, there won’t be many up there on account of the rain. Check out the Sacré Coeur perched high above Montmartre and peep the Eiffel Tower through the clouds reveling in the view at what feels like the center of the city. At this point you’ll need a change and a quick lie down. Head to your hotel and search for a dinner spot if you haven’t booked ahead (we didn’t). This is Europe. There are weird opening hours, seemingly random days that businesses close - so try not to be too picky with your choice. You could always go to Miznon (unless it’s Friday Afternoon or Saturday). If you wander around Canal St. Martin you might stumble on Café Chillango, a Mexican joint serving up tasty margaritas and and tortillas covered in and full of any number of spicy ingredients. 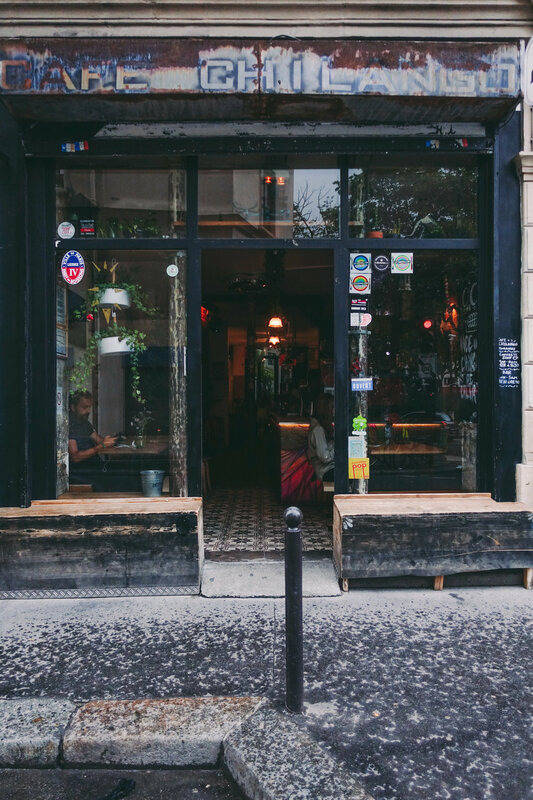 Not the first thing you might look for in Paris but its good food and good vibes, plus you can pretend you’re in Mexico for a few hours to escape the crushing rain. Day one ends with the sparkling Tour Eiffel at midnight. How you fill those hours is really up to you, Paris and the weather. If your dinner ends up being a three hour affair in an attempt to wait out the downpour, order more drinks! Drink at the bar next door. If you don’t drink - do dessert! Patisseries are practically on every corner. If you’ve eaten and drunk to your hearts content and the rain finally lets up - take a walk around the neighborhood. If there’s a theater with a commotion outside, go see what the fuss is about and buy a 20 euro ticket to see the spectacle (especially if it’s the Eurovision Drag Show at Palais de Glaces - an absolute TREAT - expect epic talent, musical and comedic performances and a fun welcoming crowd). After your evenings entertainment make your way to the Eiffel Tower. By foot, by metro by taxi, either way you will not remain dry. If you have even remotely water proof shoes, wear them. Stay focused, as you wade through moat-like puddles and feel the muddy water seeping in to touch each toe, one by one (if you are an idiot and wore espadrilles). Select a spot to enjoy the light display and take some pics while you’re at it. For five minutes at midnight the tower will sparkle (it’s on the hour after dark if you’re looking for an earlier night), and the only other people around will be couples with planned engagements - a photographer or two in tow. To play into the atmosphere, pull up your hoods and pretend you’re storm reporters at the iconic location, shouting the weather conditions into your phone as the umbrella whips inside out, “BACK TO YOU JESSICA”. Treat yourself to a car home and rest up for Day 2. Leave your luggage at reception. Grab a quick breakfast on your way south across the Seine to the Jardin des Plantes. Housing the botanical gardens, delicate greenhouses and the Natural History Museum, there’s plenty to see if the rain holds off and plenty to do if it doesn’t. If you’re there in June your whole walk will be accompanied by the insanely delightful fragrance of the lime blossoms. 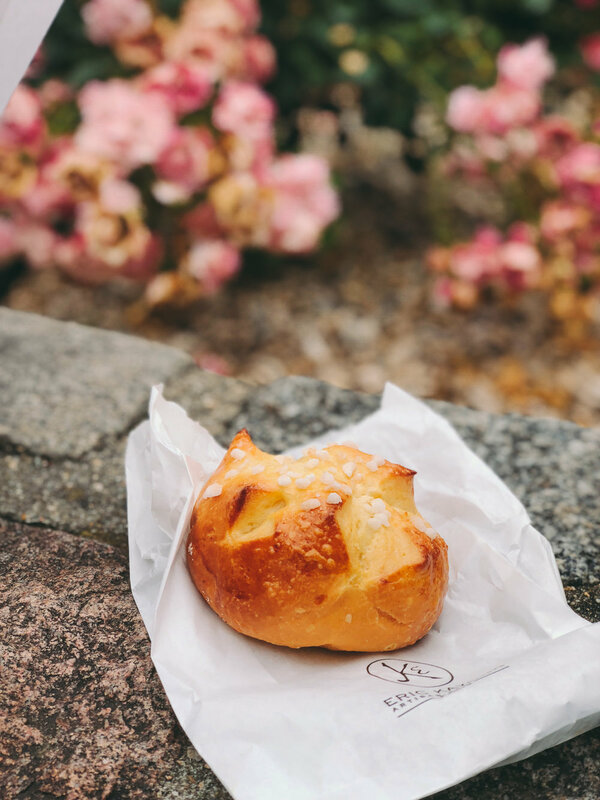 Once you’ve left the garden wander northwest to Eric Kayser for your French pastry fix. 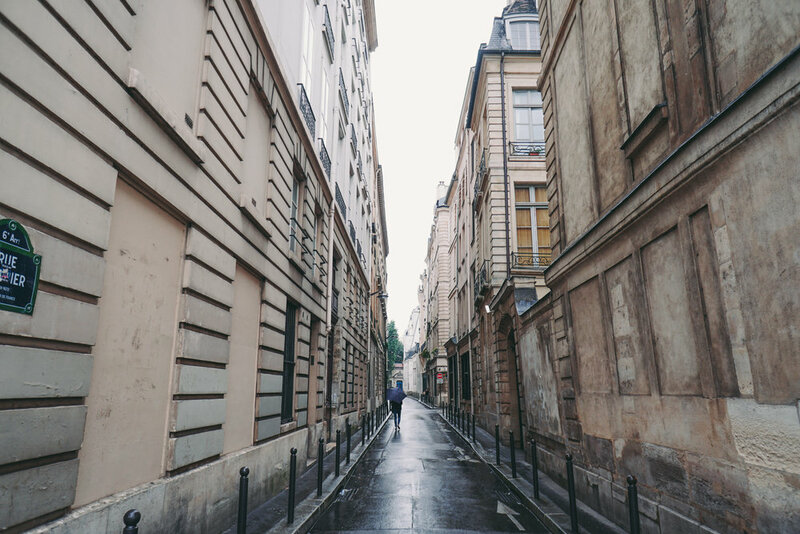 Walk up through the Sorbonne (college of the University of Paris founded in 1257) to the Pantheon, crooked alleys and hole-in-the-wall bistros line the way (keep an eye out for famous street art). The cloud cover means less harsh lighting so all the Latin Quarter architectural detail shows up in those photos you’ll be posting later on. Once it starts to rain again duck into Le Comptoir de Panthéon. Munch on a massive Croque Monsieur, crispy fries and a salad. Watch the people pass and the rain pour down. Venture out again in the drizzle and walk towards the Eiffel Tower in the distance. 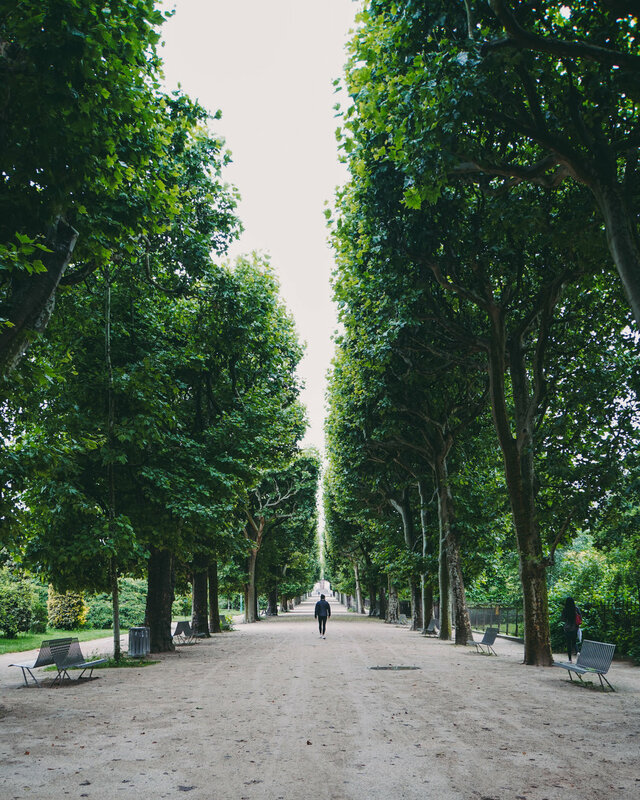 This way you’ll pass the famous Jardin Du Luxembourg, containing rows of manicured trees and it’s very own Palais with a fountain and water basin. Anyone can rent a tiny sailboat to race around with the others but batten down those hatches for when the storm clouds open! Depending on your train or flight out of the city start making your way back to the hotel to grab your luggage and be on your way. Wring out your clothes, tuck those soaked shoes (that will take literally one month to dry) in a plastic bag. Settle into your seat as you pull out of the city, knowing you did it! You braved the rain, you ate baguettes, you saw the sparkle. You saw Paris in a different light.